May is Huntington's Disease Awareness month. It is so ironic that Lacy passed away in May of last year - toward the end of the month. There is not a day that goes by when we don't think about HD and how it has impacted our family. How sad that we don't have our sweet son, how sad that so many families must say a slow goodbye to their loved ones. While there are some clinical trials going on that are promising as far as a cure for this disease, there is still not a happy ending in the foreseeable future for those who have developed symptoms of HD. 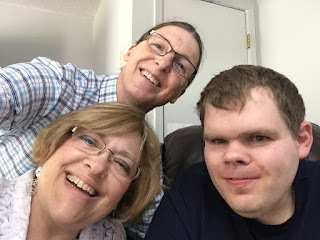 I am planning to post several times this month to recount our experiences as a family living with HD, and the inspiring people we have met who struggle every day with symptoms, or who care for loved ones who are gene positive. I want to remember the remarkable person that our son, Lacy, was and how he touched so many people in his short time on this earth. I want to express my thankfulness to God for giving us this young man to care for. I also want to express my gratefulness to all our friends and family who loved us, nurtured us, and grieved with us when we lost our sweet boy.